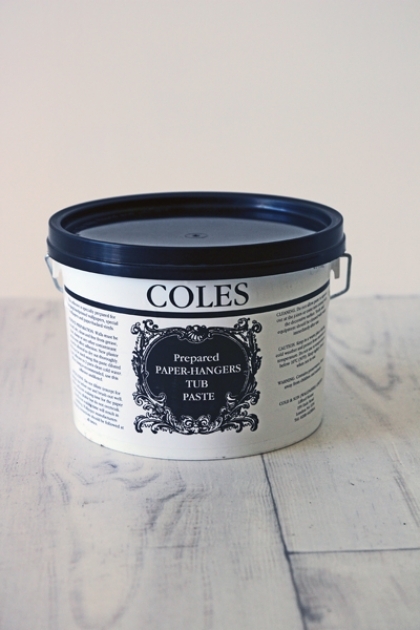 This specially prepared and ready mixed wallpaper paste is made from the prestigious brand Cole & Son who specialise in luxurious, maximum quality wallpaper, so they know what they're talking about! This is the only wallpaper paste that Rockett St George recommend to use with our eclectic choice of wallpaper and mural offerings. Based on a standard roll size of wallpaper - (roughly 10 metres long by 50 cm wide) you will require one 2.5kg tub for every 2 rolls of wallpaper. A 2.5kg tub will provide approximately 12.5 square meters coverage. After preparing the walls, line them with the appropriate grade of lining paper. We recommend using a traditional style, starch based, ready mixed tub paste for all wall coverings. PVA or PVC type adhesives are not suitable for our wallpaper as they may cause surface staining or adhesion problems. Avoid squeezing paste out of the joints. The paste should not come into contact with the printed side of the paper. THE WALLS SHOULD BE PASTED NOT THE WALLPAPER. Use a felt roller for smoothing. Only cut and hang 1 length at a time. Check which way up the design is before hanging. Do not crease the paper when folding lengths. Trim tops and bottoms of lengths with paperhangers shears or a sharp knife and a straight edge. Joints should be tightly butted and never overlap. Dark coloured wallpaper may need the edges coloured with a slightly lighter shade of chalk or pastel to prevent white edges showing. Where wallpaper rolls are numbered the hanging should be done in sequence. Ingredients: Starch derivatives, resin emulsion and a small amount of PVA glue. This is not a PVA adhesive.